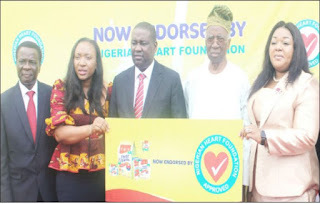 In response to the World Health Organisation’s (WHO) call for private, public and multi-sectoral collaboration in tackling Non-Communicable Diseases (NCDs), Nigeria Heart Foundation has formally sealed its partnership with Three Crowns Milk endorsement as the heart friendly milk brand. The endorsement and partnership which came during the brand’s 30th anniversary celebration will enable the two organisation to promote healthy eating habits and active lifestyle. The world health body strategies recognise that the solution to NCDs requires a societal approach, multi-sectoral actions and the collaboration of government institutions and the private sector. Unveiling the partnership and endorsement of Three Crowns milk by the Nigerian Heart Foundation (NHF), Mr. Ben Langat, the Managing Director, FrieslandCampina WAMCO, explained that both organisations share a common interest in tackling the problem of NCDs. “We understand the important role food plays in reducing the risk of Non-Communicable Diseases (NCDs) including cardiovascular diseases, like heart attack and stroke. “It is because of the close link between diet and health that our company and the Nigerian Heart Foundation, have come together today to endorse Three Crowns as the heart friendly milk brand. “Therefore, addressing the awareness of NCDs, supporting consumers in making informed dietary choices and collaborating with governments to shape evolving policies on tackling NCDs is key to FrieslandCampina WAMCO. “As Three Crowns marks her 30th anniversary of delivering complete nourishment to Nigerians, the brand in partnership with the Nigerian Heart Foundation will promote, encourage and empower Nigerians to live healthy lives. “This is significant because Three Crowns milk is the first dairy brand to be endorsed with the Nigerian Heart Foundation ‘Heart Check’ logo,” Langat said. Three Crowns was launched into the Nigerian market as evaporated milk in 1988 and in 2015 extended into milk powder category to cater for wider consumer preference. It is low in cholesterol and contains 28 vitamins and minerals needed for daily nutrition. On his part, President of NHF, Francesca Emmanuel said that they are delighted to collaborate with FrieslandCampina WAMCO on the endorsement of Three Crowns Milk which has been found to be low in cholesterol, no trans-fat and low in salt. Emmanuel, also said the foundation is pleased with signing up the Three Crowns Milk products in joining the stable of Heart health Food Products in Nigeria. 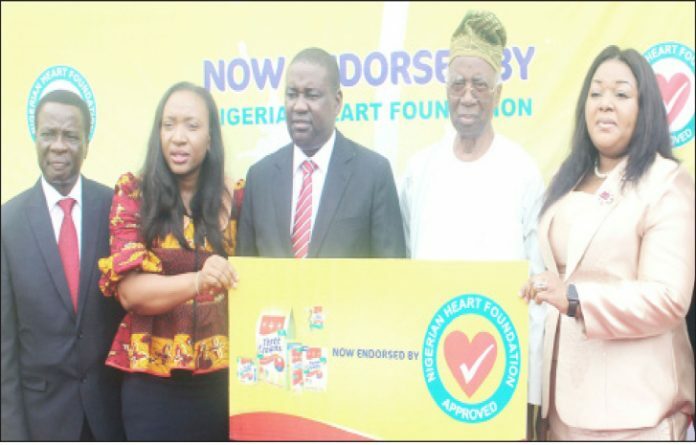 “The Nigerian Heart Foundation (NHF) Heart Check Food Labeling Programme supports national initiatives for healthier food choices, through endorsement of positive Heart Check logo on healthier food products certified to be heart-friendly,” she said.